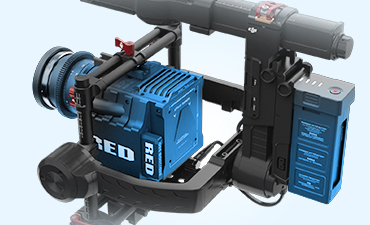 Cinematic film making demands rapid setup and a host of camera configurations. The Ronin-MX has been designed to carry many of the cameras used every day on sets worldwide, and SmoothTrack™ algorithms ensure movements are smooth in every configuration. A repositioned battery improves balance while stability is enhanced by a camera cage that locks mounted cameras in place at the top and at the bottom. Silent motors prevent on set mics picking up motor noise. Designed to resist high G-forces using powerful motors and IMUs, the Ronin-MX is engineered to maintain stability and hold horizon when mounted to an aircraft or a vehicle. 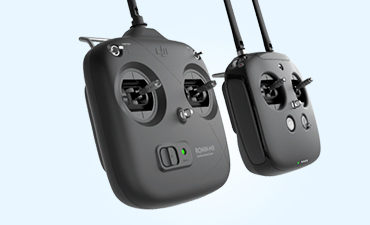 When mounted to the M600 aerial system, it communicates directly with DJI’s flight controller and when attached to vehicles, it connects to an optional GPS module allowing it to stabilize actively for a smoother shot. 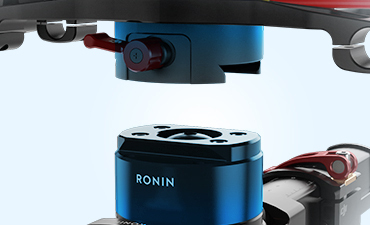 A slip ring allows the Ronin-MX to rotate 360° continuously when mounted to aircraft or vehicles, opening up more creative options. This is further enhanced by an increase in tilt axis range from 90° straight down and beyond to 135°. Popular features of the Ronin series such as the three modes of operation and SmoothTrack™ are also present, giving film makers a range of creative angles and movements. The Ronin-MX is compatible with Lightbridge 2, providing long-range HD video transmission from the air to the ground from up to 3.1miles (5km) away. If combined with the optional DJI Focus and Focus Expansion Module, focus or aperture can also be pulled remotely with a twist of the wrist. An optional Remote Start/Stop add-on provides the ability to control shooting on a range of airborne cameras. Using DJI Assistant and the dedicated Assistant app for iOS and Android allows complete customization of the Ronin-MX and its behavior. If connected to Lightbridge 2, the DJI GO app can be used to control how the M600 flies including Intelligent Flight Modes, remote control modes, move the gimbal and see an HD live feed from the camera. 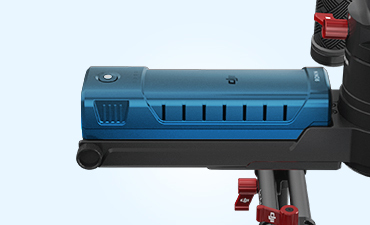 A redesigned structure moves the Ronin-MX battery from the back to the front. This centers the weight of the camera, minimizing instability when flying directly forwards. It also dramatically increases the Ronin’s agility and ability to handle rapid movements or high-G situations. Built extensively of lightweight magnesium, the Ronin-MX weighs just 6.11lb (2.77kg). This lightness allows it to be mounted to the M600 even when equipped with cameras as advanced as the RED EPIC, and to vehicles with a minimum impact on vehicle handling. 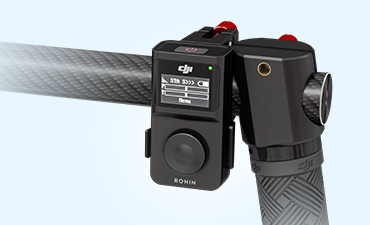 A combination of stronger motors and ESCs makes the Ronin-MX 50% more powerful than the Ronin-M. This additional stiffness and power allows the system to better withstand wind resistance when mounted to moving vehicles and aircraft, as well as more rapid movements. Cameras such as the RED EPIC need an external battery for power. 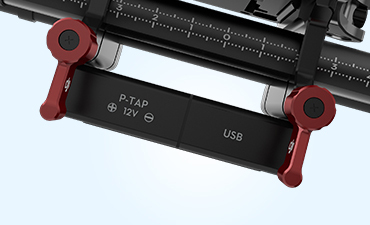 A dedicated position designed for an optional battery plate provides an easy, cable free mounting point for a 2nd DJI Intelligent Battery. This provides two 12V P-tap power sources for powering cameras and accessories. Intelligent Ronin-MX batteries are compact, light and offer a long battery life of 3 hours. Multiple batteries can be easily brought to set for a full day of filming. Over-charge and over-depletion protection is built in, as is individual cell charge balancing. Remaining power is shown by clear LEDs and in the DJI GO app. The DJI Focus uses DJI’s expertise in brushless motors for previously unheard of levels of precision and accuracy. The brushless motor puts just ±0.02 of accuracy in the hand so that turning the remote is just like turning the lens itself. It also features high torque and a fast reaction speed so that subjects can be kept in focus no matter how they move. When upgraded with a Focus Expansion Module, the Focus can control aperture or focus across Lightbridge 2’s 3.1miles (5km) range. Simple to set up and use, the DJI Ronin Wireless Thumb Controller makes controlling the Ronin-MX easy and intuitive, enabling the capture of shots that would otherwise be impossible for a single operator. 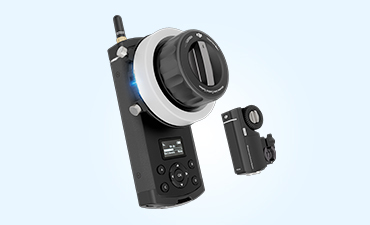 A wireless 2.4GHz remote controller is included with the Ronin-MX enabling a 2nd operator to remotely control pan, tilt, roll, and other functions. By using the optional Lightbridge 2 Remote Controller, you have long range control of the Ronin-MX up to 3.1 miles (5km). 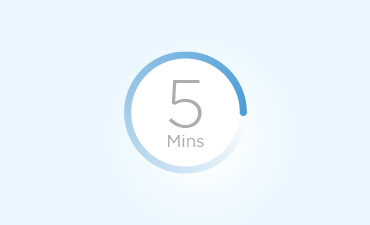 Save time and start shooting professionally stabilized video in under five minutes. Mount your camera to the Ronin-M, quickly balance it, and then tap a button. The upgraded ATS (Auto Tune Stability) technology is more precise than before and completes the tuning and balancing processes with no tools necessary. Even with only one operator, SmoothTrack™ technology ensures the Ronin-M translates movements into smooth camera angle changes. SmoothTrack™ settings from speed to deadband to acceleration are fully customizable. 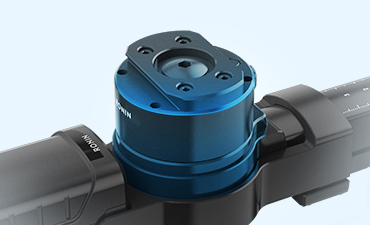 A ‘Single Axis Follow Mode’ enables two axis to be locked while SmoothTrack™ guides the camera along only one axis of motion. Three modes of operation, found on all Ronin series products, make the Ronin-MX a powerfully flexible camera stabilization system. Underslung Mode is the most common shooting mode, with the Ronin-MX held in front of the user. Upright reverses Underslung Mode and puts the camera higher up making it ideal for raised shots above people or through sunroofs. Briefcase Mode makes it a narrow platform that fits easily through narrow hallways and doors. 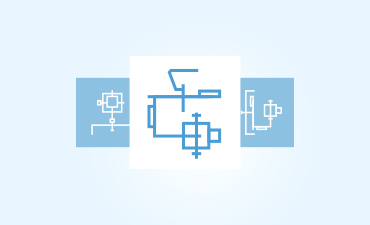 A dedicated power distribution box keeps wiring to a minimum while providing power to essential accessories. 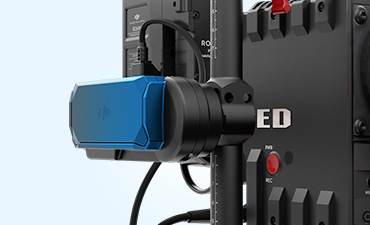 Two regulated 12V P-taps, one 500mAh full-size USB connector, and a DJI Lightbridge connector enable connectivity and power to everything a film maker needs. Mount the Ronin-MX to aircraft easily using a specially designed mounting plate. A separate universal Quick Release system that doubles as a vibration dampening system allows the Ronin-MX to be connected to everything from jib to tripod and anything in between. This plate isolates the Ronin-MX from unwanted vibrations coming from the platforms it is mounted to, and makes it usable everywhere. On the ground, the SRW-60G* allows film makers to see the image from the camera without running cables up the Ronin-MX. 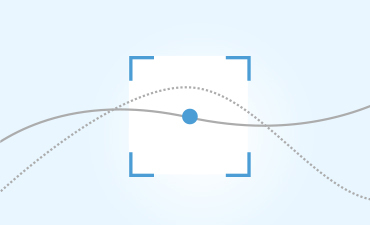 In the air, it sends the camera’s feed from the camera direct to Lightbridge 2 allowing it to stream this image down to the pilot and cinematographer. *SRW-60G is not permitted for use on aerial platforms in North America.